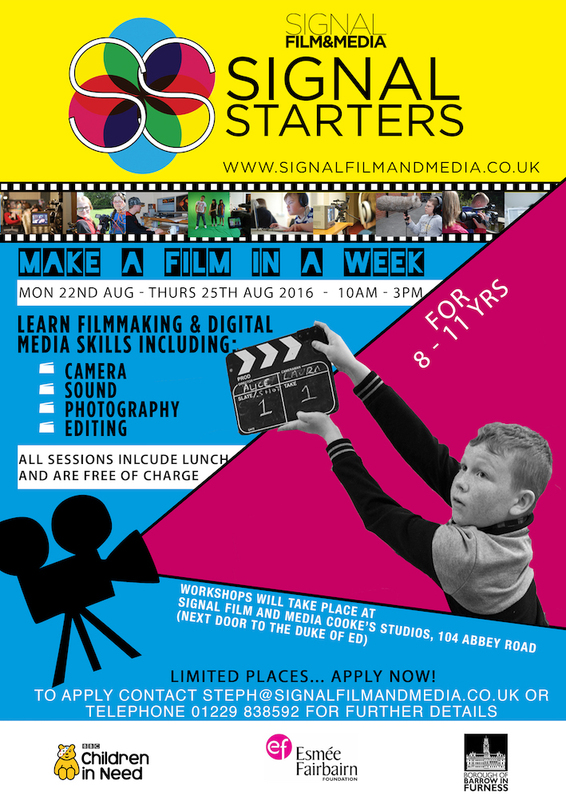 Signal Starters is a filmmaking workshop in it’s 3rd year of delivery. There are now no spaces left for the summer workshops for 8-11 years olds. Through funding from BBC Children in Need, we advertise workshops for young people living in Barrow during school holidays, we place flyers in and around schools, so keep a look out for the flyer below to when there is the next workshop available. This time the project will be focusing on animation and the young people will be working with filmmaker Karen Bird to come up with a story whilst mastering the complexities of animation. The participants will also get the chance to share their creations through a screening to parents at the end of the week. Our aims of the project are to direct youngsters in the Barrow-in-Furness area towards developing their Film and Media skills whilst also enjoying themselves and having something fun to do in the school holidays. This opportunity also offers those involved the chance to gain their Explore Arts Award. The project has proved to be extremely popular with this age group and places always fill up fast, the next cohort will open up in December school holidays so contact Steph to register your interest to be part of the next workshop.